Light and fluffy crust, rich pecan filling. For the holidays or for anytime! Everyone can enjoy our delicious pies, whether or not they happen to be gluten free! Our 9″ pie serves 8. 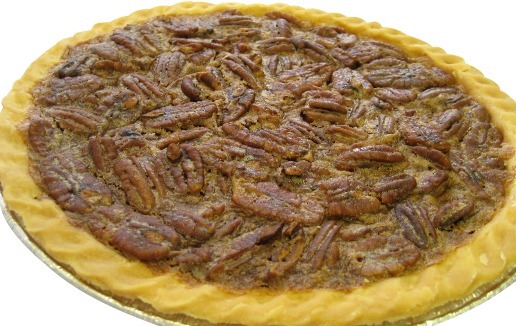 Ingredients: For the filling: pecans, brown sugar, eggs, butter, corn syrup, vanilla extract, salt. For the crust: White rice four, potato starch, cream cheese, vegetable shortening, tapioca flour, eggs, sugar, salt, water, xanthan gum. Contains: Eggs, Milk, Tree Nuts. May contain soy. Serving size: 1 slice. Calories: 583. Calories from fat: 350. Sat. Fat: 12g. Trans Fat: 0g. Cholesterol: 146mg. Sodium: 325mg. Total carb: 58g. Fiber: 3g. Sugars: 31g. Protein: 6g. We ship out on Mondays and Tuesday for maximum freshness. Please enjoy or freeze upon arrival. Orders received on Wednesdays-Sunday will ship the next Monday.